There are currently two levels of protection for the owners and occupiers of caravans stationed on protected sites. An occupier of a caravan (whether owned by the site owner or the occupier) under a residential contract has limited protection of their occupation of the caravan or the site. 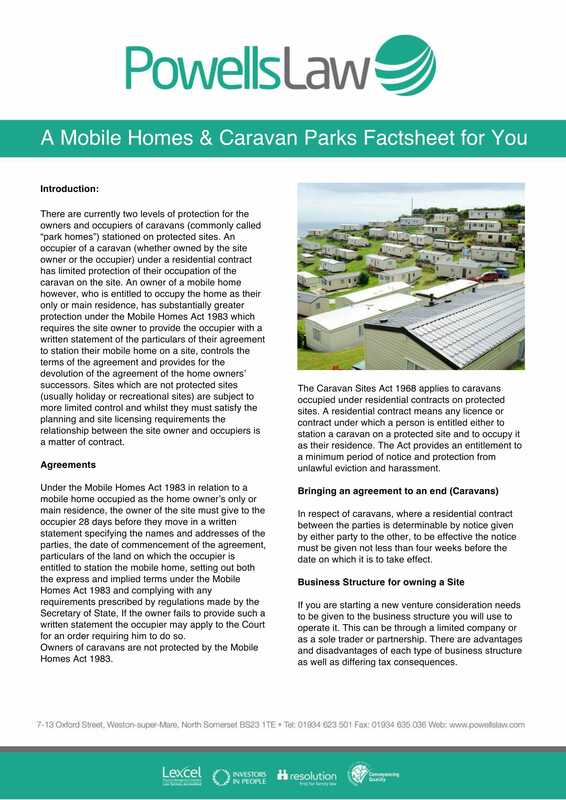 An owner of a mobile home (sometimes known as a “porta home”), however, who is entitled to occupy the home as their only or main residence has substantiality greater protection under the Mobile Homes Act 1983 which requires the site owner to provide the occupier with a written statement of the particulars of their agreement to station their mobile home on a site, controls the terms of the agreement and provides for the devolution of the agreement to the home owner’s successors. Sites which are not protected sites (usually holiday or recreational sites) are subject to more limited control and whilst they must satisfy the planning and site licensing requirements the relationship between the site owner and occupiers is a matter of contract.